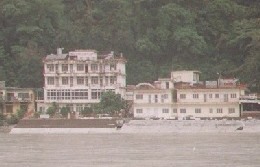 Omkarananda Ganga Sadan is a beautiful guest house at Rishikesh (Muni-ki-reti), right on the banks of Ganga, offering accommodation. 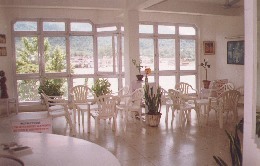 The rooms are nice and clean with a picturesque view to the holy river and the surrounding hills. Books on Yoga and Philosophy are available. Omkarananda Ganga Sadan is housing the most beautiful and prestigious Patanjala Yoga Kendra with all the sophisticated props and other equipment, which play a central role in the method of Iyengar Yoga. Yogacharya B.K.S. Iyengar has over 180 centres in 45 countries with over 12000 classes being held every week by over 3000 certified teachers. In Omkarananda Ganga Sadan Iyengar Yoga workshops are conducted daily from Monday till Saturday. The Omkarananda Public Ghat provides easy approach to the holy Ganga. Daily offerings of prayers and Arati to the holy Ganga, followed by Satsang and meditation, enhance the pious and peaceful atmosphere of the Ghat.